Published Oct 6, 2016 by Addison-Wesley Professional. Part of the LiveLessons series. 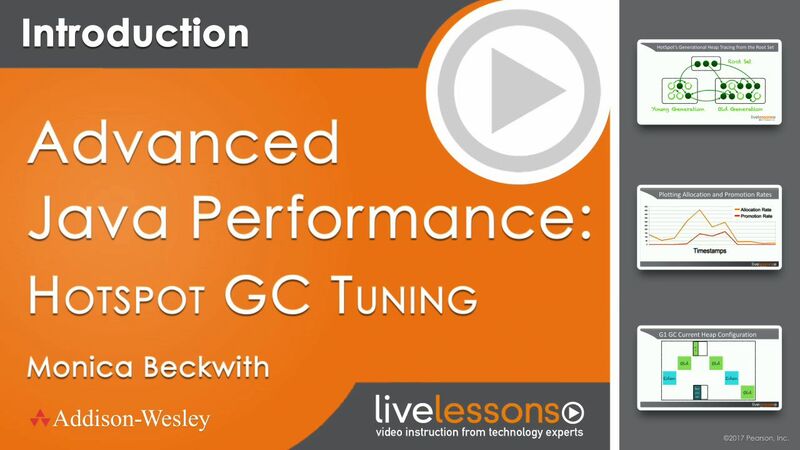 Advanced Java Performance: HotSpot GC Tuning LiveLessons covers the common fundamentals between all the HotSpot GCs and emphasize the differences. The eight lessons will arm you with what you need to tackle your application’s performance problems where the garbage collector has been identified as the bottleneck. You'll also get an introduction to G1 GC to hit the ground running now, or in the future when G1 GC becomes the default GC in JDK9. Understand the fundamentals of HotSpot’s GCs and how the garbage collector is an automatic heap management unit. Understand important GC logging options and understand the world of VisualVM and VisualGC and Metaspace. Understand GC tuning with respect to maximizing throughput or minimizing latency to achieve the goals that ParallelGC and CMS are designed for. Understand G1GC fundamentals and the importance of regionalized framework. Use logging options that help with grasping the adaptive sizing and selection logic and also that help provide more information on RSets. Use performance tuning with G1 GC by tuning the young collections, tame G1’s mixed GCs, avoid evacuation failures. Lesson 1 jumps right into the fundamentals of HotSpot’s GCs. The lesson starts with the Java runtime environment and then moves on to identifying the components of the execution engine of the Java virtual machine. You will learn about heap management and the need for generational garbage collector. It then talks about allocations and reclamations before moving on to the importance of a generation collector. Next, the it discusses the young GC algorithm and then compares and contrasts HotSpot’s Parallel GC and CMS GC. Finally, it talks about promotion failures, concurrent mode failures and fallback full collections. Lesson 2: GC Visualization and Logging Information. Lesson 2 covers GC logging and visualization information. The lesson covers certain handy logging options and provides more information on them. It also show how to add a VisualGC plugin to VisualVM. Then, the lesson looks at different information provided by VisualVM and visualizes the young and the old generations and talks about Metaspace. Lesson 3: Garbage Collector Performance Tuning. Lesson 3 provides information on GC goals and how HotSpot GCs are designed to either maximize throughput or reduce latency by designing a throughput maximizer GC and a latency sensitive GC. The lesson covers the basics of what it means to tune for throughput and you will learn how to calculate allocation rate and promotion rate. Finally you will learn to tune for latency to improve the applications responsiveness. Lesson 4 dives into G1 GC fundamentals and talks about the regionalized framework and understand how G1 handles GC time and GC frequency metrics. It then moves on to talking about G1 GC’s internal data structures and then talk about the young collections, the marking threshold and the concurrent marking phase and then finally talk about incremental collections. Finally, it covers information on fragmentation in G1 GC and then covers evacuation failures and fallback full collections. Lesson 5 covers two important log options that help with understanding and tuning G1 GC. The first one helps with understanding the adaptive sizing in G1 GC. The lesson looks at various examples to help walk you through the adaptive decisions made by G1 for a young collection and for a mixed collection. Finally, it summarizes remembered sets so as to gain tuning advantage by looking at sample outputs. works through achieving our tuning goals with minimal tuning. introduced to two options that help with the tuning. will learn how to avoid restricting G1’s adaptiveness. Then, you will see an example where you can avoid evacuation failures, by either decreasing the marking threshold, or increasing the concurrent threads or utilizing few other options. Next, you will learn how to avoid evacuation failures caused by humongous allocations.